Check out these beautiful photographs if you have a moment. The Renew website will be unveiled soon. Very soon. Recently Megan and I watched In The Shadow of the Moon. 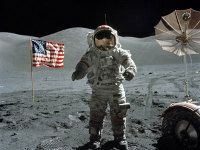 In the Shadow of the Moon is a documentary that interviews the early astronauts that first walked on the moon in 1969. With never seen before footage and great interviews, it really gives a good picture of what was running through the hearts and minds of these astronauts, as well as Americans around the country. The memory of these astronauts is amazing - the amount of detail that they remember some forty years after the first landing on the moon is astounding. I might have enjoyed it a lot more than most, partly because my grandfather was a tour bus driver at the Kennedy Space Center in Cape Cannaveral, FL for many many years. Every new shuttle launch he would send my brother and me stickers of the patches of the mission to space. We would visit the NASA Space Center often with my grandparents on spring break. I've seen several shuttle launches with my own eyes while Grandpa introduced me to NASA bigwigs. He even got me a personalized signed copy of astronaut Jim Lovell's book (Tom Hanks played Lovell in the movie Apollo 13). Even if you are not into space stuff, it's worth viewing. There is so much in there about politics, the history of the space program and NASA, American history, creation, risk, courage, human relationships, failure and God's incredible creativity. What will we miss while we are sleeping? Casting Crowns' song While You Were Sleeping is striking and challenging. I have a regular diet of certain podcasts through iTunes. They range from the serious to the sublime. CNN's hourly news update (approx. 3 minutes) - just a quick and simple way to get caught up in what's happening in the world and around the nation. ESPN Radio's Daily podcast - ear candy. Just something to have on in the background if I am reading or hanging out. (I used to subscribe to The Big Show, Dan Patrick's daily show...it was my favorite until he up and left ESPN...bummer). Great Speeches in History - a great collection of speeches that impacted our country (includes speeches such as MLK's "I Have a Dream," "Television is a Vast Wasteland," Nixon's famous "Checkers" and resignation speech, JFK's inaugural speech, Susan B Anthony's speech on women's right to vote, etc). Learn Spanish - I dabble in it and enjoy brushing up on my Spanish vocabulary. Mars Hill/Rob Bell: I subscribe and listen, just like every other Christian under the age of 30. Mosaic/Erwin McManus: I love hearing Erwin teach. He's a great influence on me. Menlo Park Presbyterian Church (MPPC)/John Ortberg: JO is one of my favorite teaching pastors - has been for many years dating back to when he was still at Willow Creek. But my favorite podcast I've come across is called Pray As You Go, run by a community Jesuits over in England that care deeply about Scripture. Very well done, I might add. It's a 10-12 minute daily podcast that is very lectio divina-esque. It's a great way to start my day driving to work. Meditative, reflective, contemplative. I feel caught up in the tradition of the faith and find that it helps me be saturated in the word on a daily basis. I recommend it highly. Check it out on iTunes. I'm curious: which podcasts you subscribe/listen to regularly?